Which patterns or designs are lead and cadmium-safe? Every piece we make is lead-safe and cadmium-safe. This includes all of the clays, glazes and decorations we use. All of our pottery meets or exceeds the standards set forth by California Proposition 65. Can I put my Emerson Creek Pottery teapot on the stove-top? While our pottery is oven, dishwasher and microwave safe, none of it can be used on the stove-top. Can I take my Emerson Creek from the refrigerator and place it directly into the hot oven? No, as any drastic temperature change may cause cracking, it is best to let your pottery return to room temperature before placing it in a hot oven. Allow the pottery to cool before placing it in the refrigerator or freezer. Do all of the glazes have the same surface finish? All of our Handpainted Collection, American Blue and Copper Clay have a smooth and shiny finish to them. Our Go Green Earthware and Dogwood have a textured or matte finish that has a little tooth to it. Will Emerson Creek Pottery dinnerware scratch my granite countertops? All of our pottery has an unglazed footer on the bottom which can be slightly rough in texture. This unglazed area prevents the piece from bonding to the kiln shelves while being fired. While we try to smooth the footer before shipping, some customers find that using very fine grade sandpaper helps even more. Also, the unglazed footer will wear down to a smoother surface with regular use. If you are concerned about your countertops, you may want to consider using a mat under your pottery. Will the decorations on the pottery peel or wear away with use? All of our decorations and glazes actually bond with the pottery when it is fired. Sometimes the decorations may be slightly raised from the rest of the surface or have a different texture than the undecorated glazed area. They will not peel or wear off over time. Which patterns will go all the way around a mug or bowl? Each of our patterns have been individually designed by our designers and artists—some wrap all the way around many of the forms, some have a hint of decoration on the reverse side and some are decorated only on one side. The continuous patterns are Field of Iris, Blueberry, Cranberry, Lavender and Tuscan Olive. I'm vegan. Are there any animal by-products in Emerson Creek Pottery? No animals are used or harmed in the making of our pottery. If I purchase Field of Iris dishes today, will they match the Field of Iris dishes purchased 4 years ago? We make every effort to insure our colors match from year to year. Please remember that we make and paint everything by hand, so some differences are to be expected. If items in my order are out of stock or if there is a problem, how will you contact me? We will contact you by email as quickly as possible if there is a delay or problem with you order. Please add our email address [email protected] to your “safe” email addresses in your SPAM settings. Something in my order arrived damaged. What do I do? While we take great care in packing our pottery for shipment, sometimes damages do occur. Please email our factory office at [email protected] with your order and contact information. Save the broken items and the box with packing materials. We will contact you as quickly as possible about replacing the damaged items. I don't use PayPal. Do I have to enter my credit card information online when I place an order? Your data is safe when you shop with Emerson Creek. Data between your web browser and our shopping cart is encrypted using 128-bit SSL Data Encryption certified through Let’s Encrypt SSL. Continually updated security measures and checks are used to protect your information. If you’d rather pay by check or over the phone, you can select “Offline” as your payment method when you are completing your purchase. Please call our office at 1-540-297-7524 with your credit card information or mail us a check. What if my flatware leaves marks on my pottery? We recommend using Barkeeper’s Friend, a mild cleaner, to remove marks left by flatware. Do I have to wash my pottery by hand? All Emerson Creek Pottery is completely dishwasher, microwave and oven safe. Your satisfaction is important to us and we’ll do everything we can to rectify any disappointing situation. 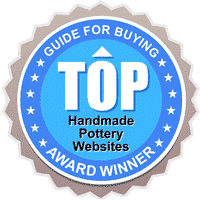 We stand behind our pottery and will warranty our ceramic tabletop products for up to one year from purchase for proven defects in manufacture, but not breakage from regular use. If you encounter issues with your pottery please contact us with details and we will help resolve the issue.